Our universal laptop skins cover any laptop/notebook up to 19" wide. 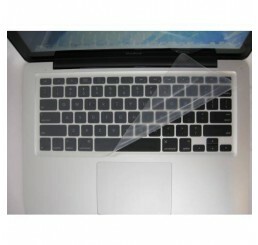 They are meant to provide easy, cost effective, and removable protection for your portable computer. The flexible silicone rubber "sticks" to your laptop without any glue or adhesive, and allows you to type on your keyboard while protecting your keyboard and laptop internals. Prevent liquid spills from destroying your computer, and keep the dust and dirt out of your keyboard at the same time. Simply lift off keyboard to clean and/or remove, or keep on all time time to protect while you type. One size fits all laptops up to 19" wide. If required to be trimmed, silicone rubber is easily cut with standard scissors to desired size.